Without a doubt there are many posts on the blog that I can say were absolutely frightening to publish. When I began the blog on my own I would freely write whatever I wanted. It wasn’t a thought. When I realized people were reading, I became aware of there being an expectation to what was being shared. It also made me tighten the reigns on what was published in terms of airing my heart and soul both from my life and creatively. Now after over six years of having this space, the following and numbers have increased and I have had to learn how to walk the line of creating content that feels like me, shares about life honestly, and allows me to creatively express myself. Having a lifestyle blog lends to talking about nearly any and everything. Some people say this is a terrible way to build a successful blog and I beg to differ maybe because the “success” doesn’t outweigh the desire to create. Sure, it is important to find your niche, your tribe, your people, but when I started TFE it was about being a place of creative freedom and sharing about the pursuit for a simple, beautiful, and creative life. The blog is a part of me and now it is apart of Mike and I’s relationship as it is the space we have grown together and been able to track our lives over the last six years and it will continue to do just that in the years to come. Part of telling our story has meant we have had to learn how to be open and honest not just about life, but with our creativity as well. If this space is about the pursuit of a creative life, than it means we must create and evolve in this space. Placing yourself out there creatively in any capacity is scary, there are a few things we have done to help ourselves have more strength to engage with the fear and move past it in the effort to become better at what we love. We thought it would be fun to share a few tips that have helped us in this process as TFE has evolved over the years. The greatest athletes, actors, business owners, and especially those you may deem successful are just as scared as you. They have put themselves out there thousands of times and the fear never gets easier just like everyone else. The difference is all in how they have chosen to deal with the fear. 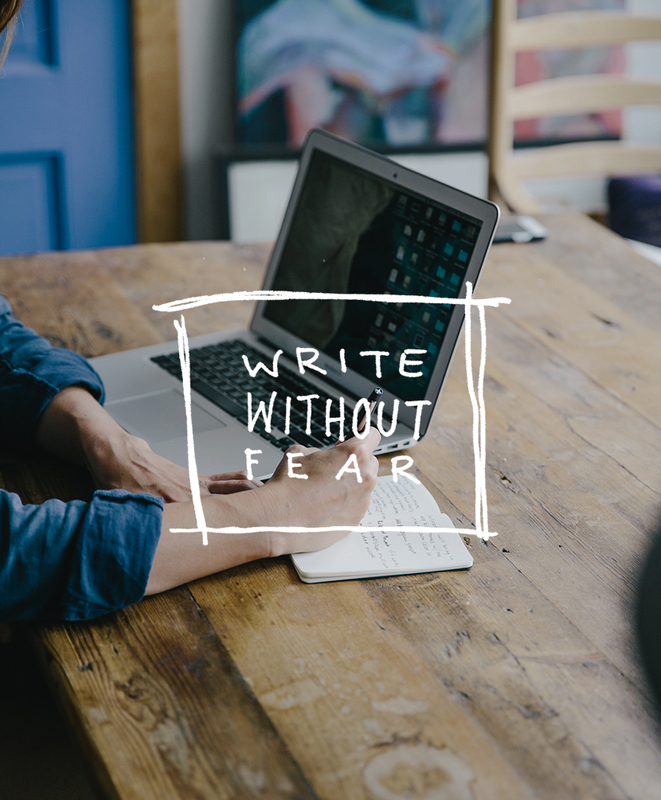 Recognizing your fear of putting out a new idea, writing something honest, etc and then doing it anyways is how you overcome the feeling of fear. Sounds simple, but we all know it isn’t, but it also is all at the same time. If you are fearful of releasing a new series, a new idea, a new photo style, a post about something really personal, whatever it is then the best way to feel confident about it is to simply make do it to the best of your ability. When I started blogging and we started creating content it wasn’t great by any means, but we did it to the best we knew how. Each time we got better, more refined, and even now we know it isn’t the best we could do, but it is what we know right now and we are doing the best we know we can here in this moment in our journey. There is beauty in the process of creating. If we were all great from the start what fun would that be? I am stealing this from Brené Brown’s TED talk about the critic because this helped me work through a lot of my fears about what I wrote and placed out in the world after feeling pretty creatively down from some experiences I had with critics. I have learned that no matter what you will have a critic in whatever you do. Someone will have a nasty word to say whether behind your back, in your comments section, or elsewhere. There is no way around the critic. Wondering what they will say and even dwelling on what was said the last time you took a leap isn’t the right way to approach it. You will find yourself never wanting to put yourself out there again, which is only allowing the critic to win. Instead, face your critic, know they will exist and despite them do your work and keep going. In the world of the internet, it is important to have the people on the other non-internet side that support you 100%. They are the ones that text you after you try something new creatively on your blog and say that was super cool and may even give some suggestions with complete care and respect of what you are doing. For us, Mike and I do that for each other but we also look to a few close friends for this as well. They get it and they want to see us succeed as much as we want them to as well. Having a community whether physically with you or around the country is crucial to creating content you are proud of as blogger. Doing creative work is not easy. You constantly feel vulnerable and this is why you must create a circle of trust. The ones inside have earned the right to be share in your vulnerability and you in their’s. If someone breaks that trust you have to draw a clear line. Negativity is toxic to a creative career. Anyone pursuing a creative career and life will tell you the importance of building a healthy circle of trust and the how positivity is very key. This one specifically has to do with writing. In order for me to share things honestly and in a constructive way I have to write in a place I can be far from the publish button. I would never dub myself a writer by any means considering I am dyslexic and I would far rather just write as I speak and forget grammar altogether, I have found that the force field a space such as Word or a private Tumblr gives me from feeling vulnerable (aka writing in WordPress) gives me the ability to write more honestly and openly. I also find these posts don’t come when forced, they typically need marinating time as well so these spaces are the perfect place to offer that for them. Most every blogger has a slew of draft posts that were written and never shared because of complete fear of what they revealed/being criticized or because of the post not being “good enough.” Sometimes those aren’t good enough excuses though and you know when they aren’t. Your gut is usually a good gauge of that. That said, sometimes after it has marinated and been worked on to your best ability, you just have to hit publish. End of story. I would love to hear how you write and create authentically on your blog. Will you guys share some tips you have as well? For another awesome blogger’s perspective on this, check out this interview with Garance Doré where she touches on this topic. Love her advice! How I Plan My Year and Business + A Free Downloadable Planner! Great post and advice about living a creative life! I never use WordPress when first writing my posts. I like to start with drafts that go through a few rounds of revisions before making their way to the final platform. I tend to jot notes down when i think of a post idea or title and refer to it for future use. If I’m not feeling inspired when it comes time to write, i just start and see what comes to me. Somehow the act of writing stikes its own creative chord. On posts of a personal nature, I always appreciate having some extra time to reflect before I hit publish. Those posts always take me the longest to write and are the ones that I try to make as perfect as possible. but at the end of the Day, i enjoy writing and i hope that comes through in each and every post i publish! Love this post, usually i write on a piece of paper, all the ideas and later in a draft in WP. I have a blog diasdeinspiracionblog.com but nowadays its become a hard work to write. Im updating it, but i dont get enough inspiration to do it. i am mexican, so My blog its in spanish maybe I rather write in english to increase my readers. Any advise? As a writer, I find that I feel most honest and true when I write without apologies. Too often I adapt the writing I share online to include words like “just” (amongst others) that actually take the power of what I’m sharing down a notch. I also write mostly in the mornings, when my mind is most clearheaded and I love, love, love the idea of writing on a different platform. I write on Word using the “focus” mode and I adore how private it feels when I write without distractions. I shared my coming out story on my blog last Christmas, and it was easily one of the hardest things I’ve ever done. I told the good, the bad, and the downright scary parts of the whole 4 year ordeal, but it’s still to this day one of my most read articles. People connect with bloggers that they can personally relate with, and sharing real life stories that scare us are what keep those readers invested in our content. This is great! I needed to find something like this to guide me and help me to be a little more comfortable with my choice of words and what I choose to share (which is probably too much)! Thank you for lending some advice! I pretend like my mom doesn’t read what I write and then just go from there. Okay so this is perfect timing! I JUST wrote a post on how not all advice is the best advice for everyone and the whole “be super SPECIFIC and only blog about certain things” rule going around was one of them. I find myself relating more to your type of lifestyle blog – seeking community and beauty in the everyday. Great post. We’re just getting started with our blog, but already we’ve received unexpected feedback and reaction from posts in which we’ve discussed issues of a personal nature. Positive feedback from people we never anticipated hearing from, and some negative reaction from unexpected quarters – particularly when we discuss our decision to move to Northern Michigan to pursue a new life. Some internalize it and feel rejected, I guess. But we’re committed to keep writing and sharing. Some people just don’t get it, which is why I like your idea of surrounding yourself with a group of supportive people offline. Keep up the good work! How are you in my head and in my heart with this one? This is so refreshingly spot on. Thank you for showing vulnerability and wrIting what so many of us feel. Everyday i struggle with how to be mu autheNtic self. How to appeal to The broader public but stay true to the reason why i starteD writing…which was to share my life and my crazy stories with the people who love me. I wish i could definitiveLy say i do x, Y and/or z but quite honestly, i have yet to figure it out. I do have an old school journal where i can take pen to paper when i just want to be free. Thank you so much for this post! people like me who are at the beggining of their blogging journey really need to read motivational and inspirational tips by people like you – who have a lot of experience – it can be really useful. Your timing couldn’t be more perfect. Thank you! I haven’t started blogging, but I need and want to. The only one or thing that has held me back is me, mostly because of my fear of writing. Your insights have given me the strategies I need to just do it! I want to star blogging and this is exactly what keeps me from giving the next step. I just over think it and always come to the conclusion that I don’t have anything interesting to write and that I wouldn’t have any readers. This is brilliant and much needed! I often mix it up where i write i posts. Most recently it has been on my actual platform, but most times I write my posts in a word document. I’m still learning to not let the critic rule. while i haven’t experienced it on my site at the moment, i know i often get really caught up in what people may think or feel and that has held me back a lot from creating or expressing myself. Thank you for sharing this gold Megan! It’s truly inspiring! thank you for sharing such great advice. I hesitated with my last post on my blog because it was the most personal post I had written so far. But having posted it and seeing the response I got made me feel much more confident in sharing with my readers. I would like to blog, but not really sure how to begin. I am an interior designer – just started my own business about a year or so ago. Any suggestions about how to begin? I completely needed to read this! wow! THANKS FOR WRITING SO HONESTLY. I Don’t do much editing and tend to just tap out whatever is most on my heart and mind, change up a few word choices here and there and hit publish. I bear my soul and that terrifies me sometimes and yet I don’t want to write otherwise. there are moments that I wonder if I am hurting myself by letting others peer deep inside, by allowing them see all the dark and gloomy and jagged bits. but I also feel there is freedom here – in being real – and creating space for others to be real with me.